Jandy is pleased to announce the release of the AquaPure Electronic Chlorine Generator. 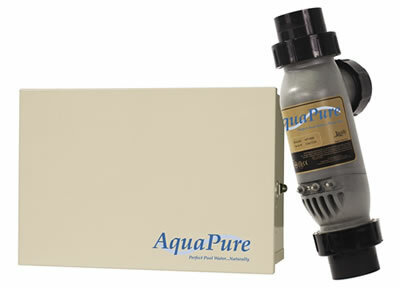 The AquaPure is a self-contained, compact, purification system, which fulfills all of the pool's sanitizing needs. Utilizing ordinary salt, the electrolytic cell generates free chlorine year round. When the chlorine is finished purifying the pool water, it converts back into salt and the whole cycle repeats. The AquaPure consists of a high, performance cell, flow/temperature/salinity sensor with housing, and a power center with digital display. The AquaPure is simple to install and will provide years of trouble-free operation.